Iron and Wine, Calexico In Concert Hear full concerts by new folk artists Iron and Wine with the roots rock group Calexico. Calexico with Iron and Wine's Sam Beam. Back row (L to R): Jacob Valenzuela, Volker Zander, Joey Burns, Paul Niehaus. Front row (L to R): Martin Wenk, Sam Beam and John Convertino. 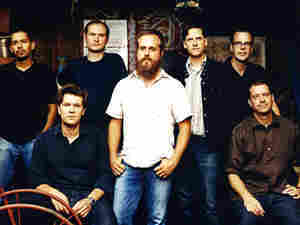 New-folk artists Iron and Wine join the roots rock group Calexico for a night of music at Washington, D.C.s 9:30 Club. Hear and download full concerts by both bands, originally webcast live on NPR.org Nov. 30 with special guest, flamenco guitarist Salvador Duran. Iron and Wine is primarily the work of Florida native Sam Beam. Beam started out as a film instructor in the late 90s in Miami. He wrote and recorded songs in his spare time and started getting attention when his lo-fi basement tapes found their way to the indie label Sub Pop. In 2002, the record company released 12 songs by Beam on a collection titled The Creek Drank the Cradle. It was followed by Our Endless Numbered Days, which some music critics chose for the best album of 2004 for its gentle, acoustic strums, spare rhythms and simple poetry. Steeped in southern lore, Iron and Wines songs are crafted in the spirit of traditional murder ballads, with brooding tales of love and death, infidelity, and religion set against delicate melodies and beautiful harmonies. The bands music was featured on the soundtrack to the 2004 film Garden State. The music of Calexico is more eclectic and more deeply rooted in rock than Iron and Wines. Musicians Joey Burns and John Convertino formed Calexico in 1990 in Los Angeles. Theyre now based Tucson, Ariz. The two use a diverse range of instruments, from cello and accordion to marimba and more standard guitar and bass. Calexicos music is part country-folk, part jazz and part rock with surprising touches of Afro-Peruvian music, traditional Portuguese folk and even surfer rock. 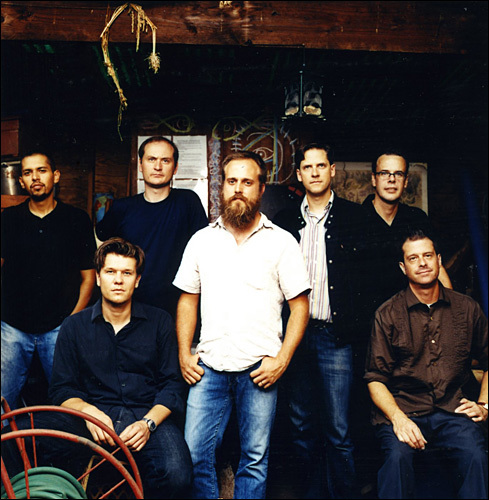 Iron and Wines Sam Beam first talked with Calexicos Burns and Covertino about collaborating in 2001. Originally Beam wanted the two to play as his backup band on the debut Iron and Wine album. But Calexico was busy producing the album Feast of Wire. Both groups continued with their own projects, but decided to enter the studio together in December of 2004. The result is the seven-track EP In the Reins. The CD blends the best of both groups, featuring Beams wispy voice, emotional depth and sense of melody with Calexicos rich instrumentation and harmonies. The 9:30 Club performance Nov. 30 featured solo performances by Iron and Wine and Calexico as well as one joint set with both bands playing together and a special performance by Tucson, Ariz. flamenco guitarist Salvador Duran. Duran can also be heard on the title track to the new Iron and Wine/Calexico CD In the reins.